More than $200 billion in adjustable rate mortgages are scheduled to reset during the second half of 2008. There is also about 11 months of inventory at the current rate of sales. 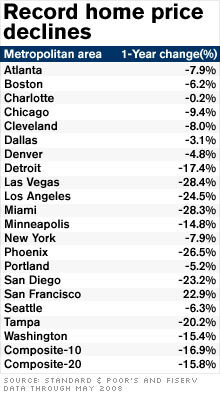 according to the S&P/Case-Shiller Home Price index. Prime loans are just the latest class of mortgages to suffer a spike in failure rates. The first lot to go bad was, of course, subprime mortgages, whose problems set the housing meltdown in motion. "that doesn't require strict documentation of a borrower's assets or income".